While last week I extolled the virtues of extending summer a wee bit, I am now head over heels in love with autumn. The apple orchards are open, squashes are filling the produce departments, and for the first time this season, we turned the heat on to take the chill out of the living room. I’ve discovered something about myself recently; despite loving summer and summer cooking, I truly am a cold-weather cook. Even on a cooler than normal day in August, my thoughts went to roasted chicken, chili, homemade bread, anything to warm the house and soul. So I am thrilled that the season is finally upon us (although not too thrilled about the idea of snow, the dark days, and really cold weather), and that the weather is now perfect for making warm, comforting stews like this one. I’ve made this recipe twice and both times it was a hit. The first time I substituted grape tomatoes for the Sun Golds and rice instead of quinoa, and it was just as good. The second time I followed it to the letter (served with red quinoa cooked in chicken broth–yum!) and it was delicious. It’s a perfect fall dish, served with a simple green salad, you can rest assured you won’t be adding to your waistline. And it’s quick! Chop everything ahead of time and you just stand and stir. Plus it makes fabulous leftovers! This recipe originally appeared in the July 2014 issue of Cooking Light. 1. Bring 1 cup water, quinoa, and 1/4 teaspoon salt to a boil in a small saucepan over medium-high heat. Cover, reduce heat, and simmer 13 minutes or until liquid is absorbed. 2. Heat a large saucepan over medium-high heat. Add oil; swirl to coat. Add onion to pan; sauté 4 minutes. Add cumin, coriander, cinnamon, turmeric, and garlic; cook 1 minute, stirring constantly. Add tomatoes; cook 2 minutes or until tomatoes begin to release their liquid. 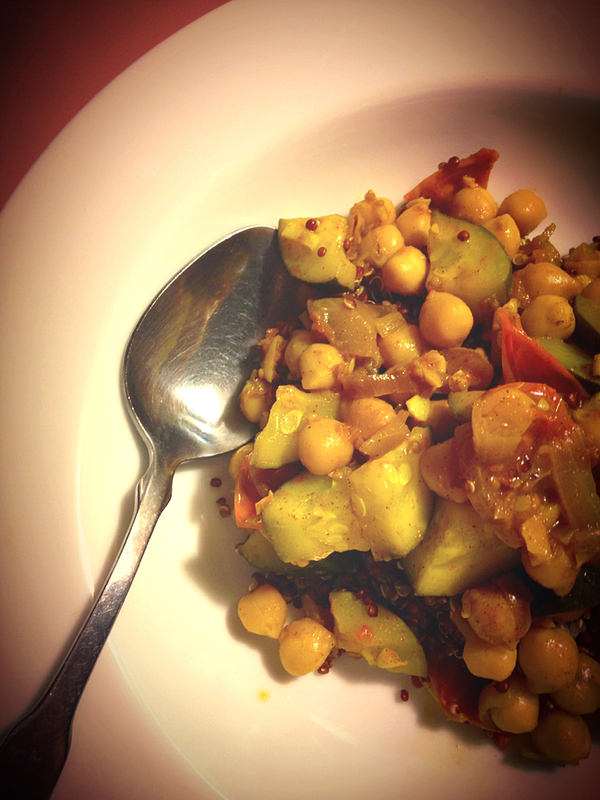 Add chickpeas and zucchini. Cover, reduce heat to medium, and cook 5 minutes. Stir in remaining 1/4 teaspoon salt and pepper. Serve zucchini mixture with quinoa. Perhaps it is the same everywhere, but I’m finding food, that is, good for you food, more and more expensive in the past few years. This question of how to eat healthy on a tight budget recently was posed on www.thekitchn.com. I am always looking for helpful hints on how to lower my grocery bill. While I’m familiar with most of the suggestions I know, I still found a few new ones that I’ll try! What are your best hints? I like to buy dried beans instead of canned and cook them up, as well as buying spices in bulk so I get as much–or as little–as I want. Plus, they are fresher! Eat well on a tight budget. This tagine looks so yummy! I love your endorsement this week- eating well on a tight budget can be such a challenge!